"হে কৃষ্ণন আমাকে পালন কর, হে নাথ ! কৃপা করি আমাকে আত্মসাৎ কর ! কৃষ্ণই আমাকে পালন করবেন—এই বিশ্বাস আমাদে থাকতে হবে ।"
"This book has been prepared under the auspices of Sri Chaitanya Saraswat Math's Present-Sevaite-Acharya, Om Visnupad Srila Bhakti Nirmal Acharya Maharaj. I bow at the feet of Sri Gurudev, the Vaisnavas, and the all-merciful Sri Sri Gaura-Nityananda. I place this book in their hands and pray that it pleases their hearts." 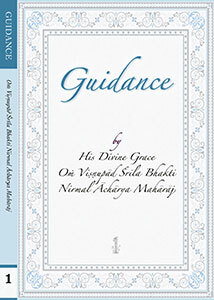 "By the boundless grace of our great-grand Gurudev, Om Visnupad Srila Thakur Bhakti Vinod, our long-standing desire to publish Sri Navadvipa-dhama-mahatmya has been fulfilled..."
"You do not have to wander any longer in this miserable world. Men and women, young and old, come immediately! Come to the divine abode made of wish-fulfilling gemstone, the land of Sri Gauranga's advent! Come and circumambulate this land in the company of loving devotees at the most auspicious time in life: the day of Sri Gauranga's advent." 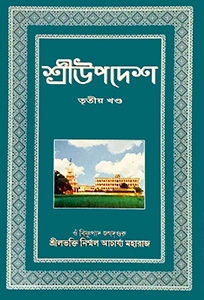 "As there are books about the glory of other Dhams, so there should be a book about the glory of Sri Nabadwip Dham"—long ago this desire arose in the hearts of the sadhus. But because such a book cannot be published until Sriman Nityananda Prabhu desires it, it has remained unpublished. Now that a suitable time has arrived by the inspiration of Sriman Nityananda Prabhu, and with the sanction of the Vaisnava sadhus, I have published this book." "One who resides in Nabadwip without duplicity and recites this prayer with devotion at the time of worshipping the Lord, genuinely attains the supremely delightful joy of love for the Lord, the embodiment of spiritual ecstasy—the son of Sachi, who is Krishna Himself." "The glories of Nabadwip Mandal are unlimited. Brahma and the other gods do not know them. So, who can describe them? Ananta Sesa is unable to describe them with thousands of mouths. So, how will I, a tiny soul, be able to? By the will of Sri Chaitanya, the devotees have ordered me, and so I describe the glories of Nadia by their mercy." "The chief of the Devas, whose body is decorated by snakes, whose body shines like the moon, who has five heads, who carries his weapon known as Pasupat, who gives boons, who is of satisfied nature, who holds the Ganga on his head, who maintains those who give obeisance to him, who is easily pleased—I offer my obeisances to Sada Siva, who is dear to Hari, and whose crown is the moon." His Divine Grace Srila B.N. Acharya Maharaj is telling how Sri Sada Siva Gangadhar and Nandi came to the Math: "So many things have happened, and it was all like a miracle..."
"...Lord Siva entered the rasa-mancha in this mood, and Krishna understood who had come. Everyone wondered where the new gopi had come from and why Krishna was giving her so much honour." 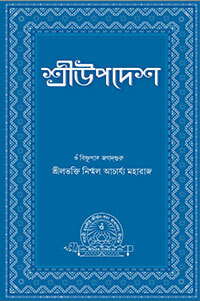 "কেউ বলে, 'তুমি শিব ভক্ত, আমি কৃষ্ণ ভক্ত !' এরকম বলবেন না । শিব আর কৃষ্ণ আলাদাও নয়, আবার শিব আর কৃষ্ণ একও নয় । শিব হচ্ছেন কৃষ্ণের অংশবিশেষ । শিব ভগবানের সেবক, শিবজী মহারাজ পরমভক্ত ।"
"O worshippable Vaishnav, ocean of grace, be merciful to this servant. Give me the shade of your feet and purify me. I clasp your feet. You can give Krishna, you have that power. Calling, 'Krishna!' 'Krishna! ', I run after you." His Divine Grace Om Vishnupad Srila Bhakti Nirmal Acharya Maharaj inaugurates a temple of Lord Siva in the quiet mileu of Kadigachha, a village in Burdwan, north-west of Kolkata, on the holy Sivaratri day. Devotees happily attend the festival of Hari-katha at the lotus feet of Sri Gurupadpadma and Lord Sada-Siva. "Nabadwip Dham shines eternally within Gauda Mandal, and is served by Ganga Devi. I do not see anyone in the world during the Age of Kali as unfortunate, pitiable, and fallen as someone who does not serve such a merciful Lord and rejects such an inconceivable abode. Therefore, brother! Give up all other desires and attachments, and devote yourself exclusively to Nabadwip Dham." Following the inauguration of the temple of Lord Siva, His Divine Grace Om Vishnupad Srila Bhakti Nirmal Acharya Maharaj holds an enormous Vaishnav seva distributing prasadam to hundreds and hundreds of devotees and well-wishers of the village. On the way from Kadigachha, His Divine Grace makes a bief stop to supervise a new construction project commenced there just recently, before heading back to the Kolkata quarters. "Devotees, listen! I will now describe everything within the thirty-two miles of Nabadwip. Circumambulation is always done in this way and is a source of unlimited joy for the soul. Those who traverse the one hundred and sixty-eight miles of Sri Gauda Mandal quickly attain the wealth of divine love for Gaura." "I offer my obeisance unto my lord, the ocean of divine love, Srila Jagannath Das Babaji Maharaj. He is the senior-most devotee, and worshipped by all who have taken shelter in Sri Nabadwip Dham and Sri Vraja Dham." "This place where we are sitting now is the samadhi mandir and the bhajan kutir of Jagannath Das Babaji Maharaj. We are paying obeisance to his place. He is our Guru parampara..."
"Feed the cows, give some garland to the cows, give some sweets to the cows. When Srila Jagannath Das Babaji Maharaj got some pranami, he would buy sweets and give them to the cows..."
"The foremost devotees of Srila Visvanath Chakravarti Thakur are Srila Baladev Vidyabhusan and Srila Jagannath Das Babaji. All the Gurus in this succession are associates of Sri Gauranga. I pray for their remnants." "I will break my head on a rock, I will enter into fire. 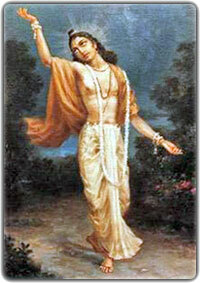 Not finding the association of Sri Gauranga, who performed His Pastimes with all these associates, Narottam Das weeps." Three educational stories from the life of Srila Bhakti Siddhanta Saraswati Thakur and his disciple Sripad B.D. Madhav Maharaj. 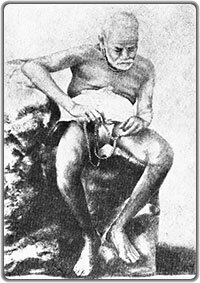 "I heard from Gurudev, one time it was Janmastami, and Madhav Maharaj (his brahmachari name was Hayagriva Prabhu) had some service in Delhi, so he had to travel by train on the Janmastami day...."
"It happened after Prabhupad Bhakti Siddhanta Saraswati Thakur's time. One time, Srila Bhakti Dayita Madhav Goswami Maharaj, Srila Bhakti Saranga Goswami Maharaj and one more sannyasi—three disciples of Prabhupad—were sitting in one room..."
"I am so wicked, how will I ever get service? I do not have any attachment to Sri Guru and Vaishnavs! It is not possible to conquer maya by engaging in maya. I see no other way to get relief except for the mercy of sadhus." "Jiva was young and had a beautiful figure. His extreme detachment was astonishing to see. After walking for many days, always filled with divine love, Jiva arrived in Nabadwip. He came to Barakona Ghat and asked everyone, 'Where is Nityananda Prabhu? Please show me.'" "The thirty-two miles of Nabadwip are nondifferent from Vrindavan. Within these thirty-two miles, there are nine islands, which form an eight-petalled lotus that floats on water. In the middle of the eight petals—the eight islands—is Antardwip. At its centre is Mayapur." "The next day in the morning, Nityananda Prabhu left the Temple with Srivas and Sri Jiva. Ramadas and other devotees accompanied them, and they chanted the Name of Gaura as they walked." "Leaving Visram Sthan, with Sri Jiva the party proceeded to the village known as Suvarna Bihar. There, Nityananda Prabhu said, 'O Jiva, this is a wonderful place. Like all of Nabadwip, it is beyond material nature...'"
"Srivas danced with Jiva. Sometimes they cried, and sometimes they danced continuously. All the other devotees danced as they walked. Hearing the glories of Gauranga from the mouth of Nitai, Jiva floated in the greatest joy." "Coming into Madhyadwip and laughing, Nityananda Prabhu said, 'This is Majida Gram. The seven sages resided here and worshipped the moon-like Sri Gaura. The mercy of the Dham is supreme. Those who attain it, attain the association of the sadhus. Serving in the association of the sadhus and becoming immersed in divine love for Krishna is the ultimate joy." His Divine Grace Om Vishnupad Srila Bhakti Nirmal Acharya Maharaj attends a small house preaching programme preaching the conception of Sri Chaitanya Saraswat Math and nourishing devotees' hearts. Chapter Ten: Visiting Sri Brahmana Puskara, Sri Uchcha Hatta, etc. "At dawn, Nityananda Ray took Jiva and went out to tour the Dham. He said, 'Jiva, look at this beautiful village. Everyone now calls it Brahmanpur....'"
The Adhivas (eve) of Sri Nabadwip Dham Parikrama is spent happily with more and more devotees flocking in from various corners of the world securing the glory of the Festival. His Divine Grace lovingly welcomes everyone and gives everyone an opportunity to engage in service of Sri Sri Guru Gaura Nityananda—sravanam, kirtan, smaranam, vandanam, dasyam, sakhyam, and atma-nivedanam—according to the devotees' fortune, hankering and qualities. "Who can describe the glories of this place? It is not a holy place that is now simply a dry river. All souls who give up their life in the water, on the earth, or in the air here attain Sri Goloka Vrindavan." Pictures from Thursday—morning, noon and evneing programmes, services and activities at Sri Chaitanya Saraswat Math, Nrisingha Palli, in the shade of the holy lotus feet His Divine Grace Om Vishnupad Srila Bhakti Nirmal Acharya Maharaj and dignitary Vaishnavs and devotees. His Divine Grace Om Vishnupad Srila Bhakti Nirmal Acharya Maharaj supervises and directs numerous services in preparation of the temple to welcome the devotees. Devotees happily and greedily participate in any services available. His Divine Grace Om Vishnupad Srila Bhakti Nirmal Acharya Maharaj and dignitary Vaishnavs carry the banner of Sri Chaitanya Saraswat Math through Godrumdwip and Madhyamdwip: Subarna Bihar Gaudiya Math, Sri Samadhi-mandir of Srila Bhaktivinod Thakur, Sri Surabhi Kunja Math, Hari-Hara ksetra are among the places visited. "You must see the sadhu with your ears, because you cannot see a sadhu with your eyes. This is actually not a place for play or tourism, this is a place for sravan and kirtan. You must listen with your heart." Sharing photographs of the second day of the Holy Sri Nabadwip Dham parikrama led by His Divine Grace Om Vishnupad Srila Bhakti Nirmal Acharya Maharaj and dignitary Vaishnavs through Antradwip and a part of Simantadwip: Srila Madhav Maharaj's Math, Nandan Acharya Bhavan, Puspa-samadhi mandir of Srila A.C. Bhaktivedanta Swami Maharaj Prabhupad, Madhai Ghat(! ), Yogapith, Srivas Angan, Sri Gadadhar Pandit's house, Samadhi-mandir of Srila Bhaktisiddhanta Saraswati Thakur and Sri Chaitanya Math, Sri Jagannath Temple, Simantadwip. "When will you come to Me? When will you come to serve Me? "—the Lord goes to the extremes waiting for us to come to Him, so why is it that we still cannot come to Him? From Affectionate Guidance: "Today is a most auspicious day—the holy Disappearance Day of Srila Madhavendra Puripad. The sprout of divine love for Krishna (Krishna-premankur) appeared in this world in the form of Srila Madhavendra Puri. Mahaprabhu and Nityananda Prabhu glorified Srila Madhavendra Puri so much. Nityananda Prabhu and Advaita Prabhu were disciples of Srila Madhavendra Puri..."
"Where has Advaita Acharya gone? Where are my Svarup, Rupa, Sanatan? Where is my Raghunath? Where are the saviours of the fallen souls?" Sharing photographs of the third day of the Holy Sri Nabadwip Dham parikrama led by His Divine Grace Om Vishnupad Srila Bhakti Nirmal Acharya Maharaj and dignitary Vaishnavs through Sri Koladwip, Sri Ritudwip, Sri Jahnudwip, and Sri Modadrumadwip: Sri Samudra ghat, Sri Sri Gaura-Gadadhar Mandir (Champahatti), Vidya Nagar Sarvabhauma Gaudiya Math, Sarvabhauma Bhattacharya's house, the Deity served by Sri Saranga Murari, place where Mahaprabhu performed kirtan(! ), and Srila Vrindavan Das Thakur's appearance place. Sharing photographs of the fourth day of the Holy Sri Nabadwip Dham parikrama led by His Divine Grace Om Vishnupad Srila Bhakti Nirmal Acharya Maharaj and dignitary Vaishnavs through Sri Koladwip: Sri Chaitanya Saraswat Math, Buroraj Siva temple, Prauddha Maya Devi's temple, Sri Vishnupriya Devi's house, the samadhi mandir of Srila Jagannath Das Babaji Maharaj. Srila Bhakti Nirmal Acharya Maharaj: "Spend this day chanting the Holy Name." His Divine Grace Om Vishnupad Srila Bhakti Nirmal Acharya Maharaj leads the grand annual festival in honour of Sriman Mahaprabhu's appearance in the company of Srila Bhakti Pavan Janardan Maharaj, Srila Bhakti Kusum Ashram Maharaj, Sripad Bhakti Kamal Tyagi Maharaj and many other dignitary Vaishnavs, devotees and guests. The programme starts at 4 p.m. and ends with anukalpa prasad distribution at 9 p.m. onwards. Photographs from the morning programme at Sri Chaitanya Saraswat Math, Nrisingha Palli: morning arati, initiations, and noon lectures by His Divine Grace Om Vishnupad Srila Bhakti Nirmal Acharya Maharaj, Srila Bhakti Pavan Janardan Maharaj, Srila Bhakti Kusum Ashram Maharaj, and Sripad Bhakti Kamal Tyagi Maharaj. "By His causeless mercy the full moon, Gaurahari, rose in the district of Nadia, which is compared to Udayagiri, where the sun first becomes visible. His rising in the sky dissipated the darkness of sinful life, and thus the three worlds became joyful and chanted the holy name of the Lord." The grand Festival of Sri Gaura Purnima concludes with the traditional Sri Visva Vaishnava Raja Sabha where all the assembled leading Vaishnavs extol the glories of Sriman Mahaprabhu, His associates, Dham and devotees. "At dawn, the devotees arose and called out to Sri Gaura and Nitaichand. Feeling great joy, Nityananda and the devotees then departed, leaving Champa Hatta behind..."
"Again and again I offer my obeisance unto You, Sri Krishna Chaitanya, the supremely merciful, golden form of Sri Krishna, the giver of Krishna-prema." "Standing erect, the hairs of His body rebuke the blossoming campaka flowers. Raising His arms, again and again He calls out "Hari! Hari!" Surrounded by His devotees, again and again He sings and dances. Streams of tears flow from His eyes and sprinkle the ground. Let us glorify Him, Lord Gauracandra." "We are very happy today because we are going to celebrate the festival of Jagannath Misra's ananda-mahotsav. Today we are also making a special festival for our best friend Sripad Yudhamanyu Prabhu Seva Vikram..."
"We are going to celebrate, but this celebration is not for our own happiness, it is for the happiness of the devotees, for the happiness of the Vaishnav Thakur. This is the main thing." Lecture delivered on Sri Jagannath Mishra's Anandotsav in 2013: "We can realise it ourselves: how much can we proceed in our spiritual life and why did we come to Sri Chaitanya Saraswat Math? Again and again we do Nabadwip Dham Parikrama, but how much can we use ourselves for the service to the Guru, Vaishnavs, and Bhagavan?" Lecture delivered on Sri Jagannath Mishra's Anandotsav in 2013, part two: "I am praying to you all that you do not forget your service to your Guru, to the Vaishnavs, Bhagavan. I am bowing at your lotus feet: if you serve my Guru, I will serve you my whole life; if you serve my Guru, I will sacrifice my life to serve you." "Gurudev told me, 'The day after Gaura Purnima, you will sit together at Vishva Vaishnava Raja-Sabha,' and it is my duty to do that. We have come here to be together, and everyone can speak their own language—if it can be translated into English and Bengali, that is good for the mission." An archive recording of Srila Bhakti Sundar Govinda Dev-Goswami Maharaj reading from the first chapter of Sri Chaitanya-bhagavat, Adi-khanda, where Srila Vrindavan Das Thakur describes the Lord's appearance. "Proceeding to Mamgachhi Gram, Nityananda Ray said, 'This is Modadrumadwip. Ayodhya is present here.'" "Arriving in Sri Vaikunthapur, Nityananda Prabhu smiled gently and spoke to Sri Jiva. 'Please listen carefully. Here, on one side of the eight-petalled lotus of Nabadwip, is Vaikunthapur.'" "In Sri Gaura Mandal, there is a village called Hapaniya where my Lord, an abode of all good qualities, appeared. It stands on the bank of the Ganga, who is very merciful to the fallen souls; renowned in the whole world, this abode is a holy repository of knowledge and jewels of logic." "Today is the pancham dol and it also the appearance day of Sri Sri Guru Gauranga Radha Gopinathjiu. This is a highest place and we must give respect to this place, Sripat Hapaniya Dham." "We come here to pay obeisance to Srila B.R. Sridhar Dev-Goswami Maharaj because he is not an ordinary person. We come and pray to his family, we pay obeisance to them and beg them for mercy. That is why we come here." "Today we have very happily come to Sripat Hapaniya Dham. Our destination is Goloka, even if we may not know where Goloka is. However, we must know that the abode of Goloka has personally become manifest in this world as the abode of the Divine Master, the residence of the devotees and the Temple where the Deities are worshipped. " The final day of the grand annual festival at Sri Chaitanya Saraswat Math concludes at Sripat Hapaniya Dham, the birthplace of Om Vishnupad Srila Bhakti Raksak Sridhar Dev-Goswami Maharaj. His Divine Grace Om Vishnupad Srila Bhakti Nirmal Acharya Maharaj takes devotees to Sripat Hapaniya Dham to honour the installation day of the presiding Deities at the temple. This year, many devotees from Bokaro have not been able to come to Nabadwip, but as soon as the group that did come returned, they made a large Sunday programme to share the wonderful experience. For the pleasure of His Divine Grace Sri Gurupadpadma, devotees from Orizaba are sharing the photographs of the recent Sri Gaura Purnima celebration with a brief report of the activities. 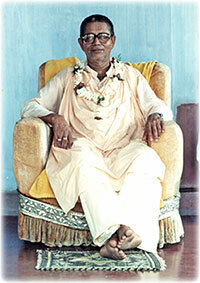 "Glory to Srila Gurudev, Sri Bhakti Sundar Govinda Dev-Goswami Maharaj, an ocean of mercy. He manifested the effulgent service of Sri Nitai Sri Gauranga-dev in Sri Nabadwip Dham for the benefit of the entire world." "All glories to Nrisinghadev! All glories to Nrisinghadev, who is the Lord of Prahlad Maharaj and, like a honeybee, is always engaged in beholding the lotus face of the goddess of fortune." "Srivas Pandit: 'You can get a son, a daughter, a father, a mother in every birth, but you will not get the Lord in every birth Lord. This life is very important, you can get the Lord in this life, then why should I misuse it? Why should I not use this opportunity?'" "The name Srivas Pandit's wife is Malini Devi. You know, one time Malini chastised Srivas Pandit. Once, Vishvarup Prabhu, Nimai's elder brother, came to their house to ask Srivas Pandit for help..."
Why Can We Not Get It? "At Srivas Pandit's house there was a maidservant Duhkhi—she got Mahaprabhu's mercy. There was a Muslim tailor near Srivas Pandit's house—he too got Mahaprabhu's mercy. A great sinner Chand Kazi broke a mridanga, but even he got Mahaprabhu's mercy. Why can we not get it?" "O worshippable Vaisnava, be merciful to me this time. O saviour of the fallen, without you there is no one. In every birth I aspire for the dust of your feet." "I am so wicked, how will I ever get service? I do not have any attachment to Sri Guru and Vaishnavs! Prabhu, you see no fault in others, you are the saviour of the fallen. Please deliver Narottam this time!" "The feet dust of the Vaishnavs is where I sport and take bath, Vaishnavs' name is the water oblation. My mind is intently fixed upon the remnants of Vaishnavs, and I am elated hearing the name of Vaishnavs." Vaishnava iCalendar is prepared and now available for download and upload on Apple mobile devices (iPads, iPods, iPhones, MacBooks, etc.). On computers: download and launch. On mobile devices: upload by clicking on the link above, through iTunes synchronisation or email. "Nityananda Prabhu crossed the Ganga, went a little ways ahead, and said, 'O devotees, look! This enchanting place is named Bilvapaksa. Everyone calls it Bel Pukhariya. See here in Nabadwip the place which the scriptures call Bilvavan in Vraja Dham.'" "Affectionately, Nityananda Prabhu asked, 'When will you go to Vrindavan?' Jiva answered, 'The order of the Lord is above all. When I receive Your order, I will take shelter in Vrindavan. I have one or two questions to ask You. O Lord, please answer them for the benefit of this servant.'" "'The Lord has given you the qualification to stay in Vrindavan. O Jiva, do not delay going to Vraja any longer!' Saying this, Nityananda Prabhu placed His feet on Jiva's head and empowered him." 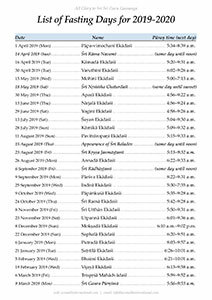 A list of all ekadasi tithis as well as other fasting days for the current 2019-2020 including the dates of the fasts and the times of the paran. I offer my obeisance unto he who perfectly fulfils his Gurudev's most cherished desires; who is fully adorned with the blessings of his Gurudev’s associates; who is expert in all aspects of Vedic knowledge, both conceivable and inconceivable; who is the pre-eminent follower of Srila Rupa Goswami Prabhu's line; who is known as 'Govinda'—Srila Bhakti Sundar Govinda Dev-Goswami Maharaj; whose beautiful, effulgent, exalted form is infused with pure devotion; who is the Guru of the entire universe; and who is the giver of the seed of divine love for the Supreme Lord. We are offering obeisance at your holy lotus feet and on behalf of His Divine Grace Om Vishnupad Srila Bhakti Nirmal Acharya Maharaj humbly extend an invitation to join our Sri Chaitanya Saraswat Math in the devotional programme in honour of the disappearance of our most worshippable and beloved Om Vishnupad Jagad Guru Srila Bhakti Sundar Govinda Dev-Goswami Maharaj which manifests on 16 April (Tuesday) this year and shall be observed in Sri Chaitanya Saraswat Math TARAKESHWAR. • 17 April—festival prasad distribution and concluding programmes. We kindly invite you to participate in the special programme of glorification, worship, kirtan, prasad distribution, and other devotional activities to be held on this auspicious day. We shall feel blessed to have your association and presence at the main festival held at Sri Chaitanya Saraswat Math, Tarakeshwar, or at any of our affiliated centres worldwide.